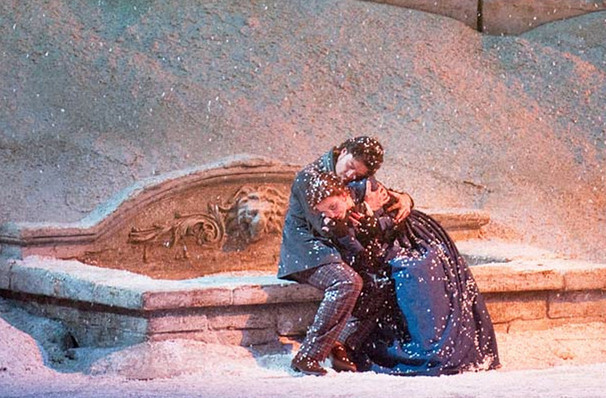 Why See Metropolitan Opera - La Boheme? Franco Zefferelli's spectacular production returns to the Met once more. Since its premiere in 1896, La Boheme has grown into one of the most beloved operas in the world, with only Puccini's other masterwork Madama Butterfly rivaling it for sheer popularity. Split between three casts, the staging is a Met favorite, with no season complete without it! A four-act tragedy, the story delves into 1830s Paris where a group of struggling artists lives in destitute slum conditions, yet are determined to celebrate love in all its simple glory. When Rodolfo helps his pretty neighbor Mimi to find her keys in the dark, their hands touch, and attraction flares within them. The story then moves on over the course of a few months, where Mimi is found to be terminally ill from consumption; despite having broken up, Rodolfo cares for her deeply and is heartbroken to hear that she is dying. He carries her upstairs to his couch and caresses her, as she slips away in his arms. Sung in Italian with English, Italian, Spanish and German Met Titles. Sound good to you? 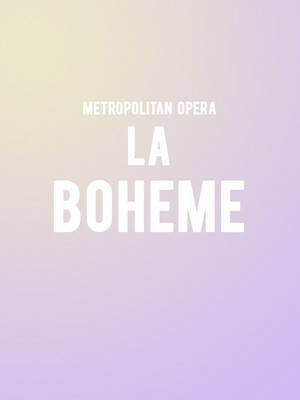 Share this page on social media and let your friends know about Metropolitan Opera - La Boheme at Metropolitan Opera House.